South Africa is known for its vast expanse of wilderness which is home to magnificent creatures such as elephants, lions, rhinos, leopards, and giraffes. Visitors from around the world flock to the African country each year to see these awe-inspiring animals in person, usually from the safety of a guided safari vehicle. When Arnold Schwarzenegger made the trip recently, he also found out just how terrifying these massive mammals can be. What starts off as a mesmerizing up-close encounter quickly turns frightening when the elephant backs away from the vehicle as the engine starts up. One passenger asks, “Is he backing up because of the engine?” Arnold responds, “No, he’s going to charge us.” Of course, he’s no expert, but after starring in a slew of awesomely bad action movies, Arnie can obviously recognize aggression when he sees it. 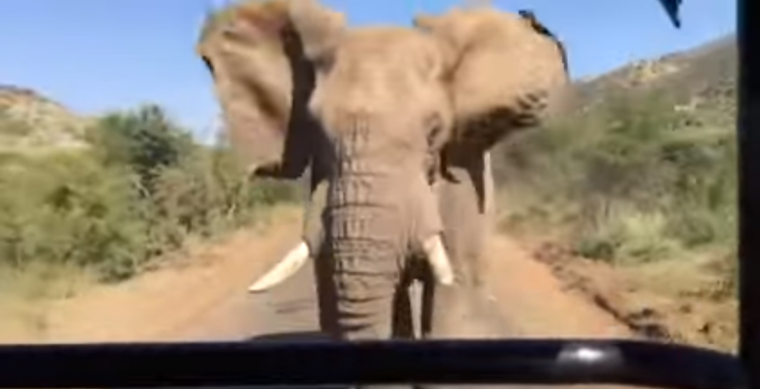 As the elephant circles around the vehicle, the driver decides it’s time to hot-foot it out of there—and just in time. The elephant begins chasing the car as it drives away, causing the aforementioned NSSFW language (because “Oh, darn” just wouldn’t cut it). Wise words indeed from the gubernator himself (and hopefully everyone in the car thought to pack a spare change of clothes).